Create a personalized and elegant feeding area for your pet with the Whitehall Monogram Pet Feeding Station. This lovely and functional unit places food and water at the proper height for your pet, preventing neck strain and keeping pests from reaching the feed. The scrolled backing attaches to a wall with three included screws, and its bronze color adds a timeless look. Gold colored highlights bring shine and interest to the piece, for an antique color scheme, and the center of the item houses a monogram to personalize it for your pet. Use a scroll design in this square if the station is used by more than one animal. A holder for the two included 2 quart stainless steel bowls attaches to the front of the plate, and the bowls lift out of the ring for easy refills or thorough cleaning. The cast aluminum construction forms a lasting station, durable enough for use for several seasons. 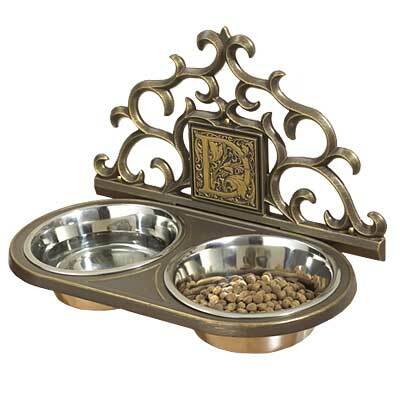 Offer your dog or cat a healthy and stylish dining area using this Monogram Pet Feeding Station. Assembly required. Made in the USA. Shipping: This item may be shipped via UPS Ground only.